Shadow at Mercy - Be Our Guest! Shadowing is the best way to experience our amazing atmosphere at Mercy! Eighth grade students are invited to shadow in the fall and seventh grade students in the spring. You have the opportunity to tour our awesome 24-acre campus, attend classes, meet teachers and coaches, enjoy a complimentary lunch, and experience the Mercy sisterhood! Prior to your shadow day, you are assigned a Mercy student as your personal tour guide. These pairings are made based on interest, or, if you know a student at Mercy, you may request her by name. Shadow days are from 8:15 a.m. - 1:45 p.m.
For more information, please contact Paige Stewart at (502) 671-2021. This form must be completed by a parent or guardian. We will contact you within two school days to confirm your visit and provide all necessary details. Advanced - for those looking for that extra challenge, with more independent-style work and moving at a faster pace. Honors - our fabulous college preparatory program. Academic - for those performing a little below grade level who need a smaller environment that is very structured by the teacher. Parent Tour? Available in the morning, lasting about 30 minutes. Would you be interested in a parent tour on the day your daughter shadows? 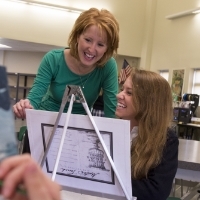 Mercy has an amazing environment for nurturing your talents and encouraging you to succeed.